It’s Yoshi weekend! Yoshi’s Crafted World launched yesterday on Switch, adding to a long line of Yoshi games that have come before. Everyone knows about the mainline Yoshi platformers, like Yoshi’s Island and Woolly World, but not everyone has heard of some of the Dino’s weirder spin-offs. Let’s take a look! In 2005, Yoshi fans got a pretty experimental title on the GBA. Known as Yoshi’s Universal Gravitation everywhere but the US, Yoshi Topsy-Turvy was definitely an oddity. 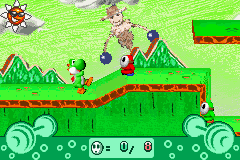 The game’s oversized cartridge featured a built-in tilt sensor, and the core gameplay saw players tilting their systems to roll Yoshi through levels on a ball. You could even play with the GameBoy Player by picking up and tilting your GameCube! The same year, Yoshi Touch & Go launched on the brand new DS system. The two screens acted as one giant view and, this time, players didn’t actually have direct control of Yoshi. 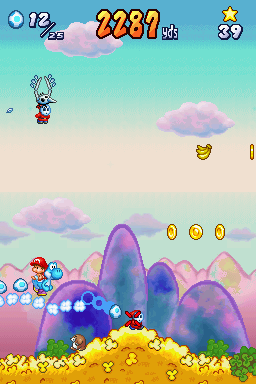 Instead, you could create clouds for Yoshi to stand on and throw eggs all over the screens. Fun personal story about this one – I bought it for my mom for Christmas, but it turned out to be a bootleg copy that didn’t save right. She and I have played the first level of that game countless times! 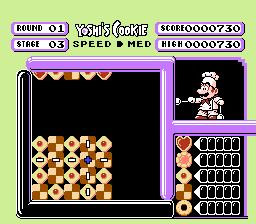 Yoshi and Yoshi’s Cookie are puzzle games that both released on the NES and GameBoy. Yoshi was actually developed by Pokemon Creator Game Freak, a handful of years before Red and Blue took the world by storm. A year after Yoshi, the Nintendo-developed Yoshi’s Cookie released, and its titular cookies have cropped in many games since, ranging from Super Mario Galaxy 2 to Double Dash. And of course there’s Tetris Attack, the Yoshi-themed reskin of Japanese favorite Panel de Pon. 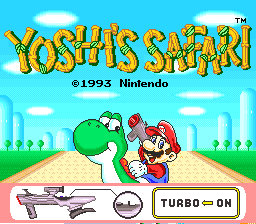 In 1993, Yoshi’s Safari released on the SNES. Essentially Mario’s one and only FPS that plays like a light-gun shooter, Yoshi’s Safari has you play as Mario riding on Yoshi’s back, shooting Bowser’s minions who, coincidentally, are also armed with guns. The game utilizes the SNES’ Super Scope, which made it difficult for most SNES owners to access. Fun fact – I recently saw the cartridge for this game at a used game store. If the sticker hadn’t been ripped, I’d be the proud owner of Yoshi’s Safari! What’s your favorite Yoshi game? And, are you enjoying Yoshi’s Crafted World? Let us know on Twitter or in the comments!